What does the GiST API do? And what does it mean to extend Postgres’s indexing system, exactly? Read on to find out! In the last few posts in this series (one, two, three, and four), I showed you how to save hierarchical data into a flat database table using the Postgres LTREE extension. I explained that you represent tree nodes using path strings and how to search your tree data using special SQL operators LTREE provides. But the real value of LTREE isn’t the operators and functions it gives you — internally, these boil down to fairly simple string operations. Instead, what makes LTREE useful is that it integrates these new operators with Postgres’s indexing code, which allows you to search for and find matching tree paths quickly. To achieve this, LTREE takes advantage of the Generalized Search Tree (GiST) project, an API that allows C developers to extend Postgres’s indexing system. But what does the GiST API do? And what does it mean to extend Postgres’s indexing system, exactly? Read on to find out! 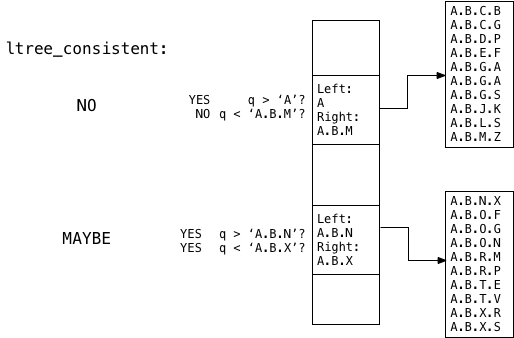 Note that the path column uses the custom ltree data type that the LTREE extension provides. If you missed the previous posts, ltree columns represent hierarchical data by joining strings together with periods, i.e. A.B.C.D or Europe.Estonia.Tallinn. For each and every record in the table, Postgres executes a comparison p == q where p is the value of the path column for each record in the table, and q is the query, or the value I’m searching for (A.B.V.T in this example). This loop can be very slow if there are many records. Postgres has to check all of them because they can appear in any order and there’s no way to know how many matches there might be in the data ahead of time. Postgres starts by checking the value in the middle of the index. If the stored value (p) is too large and is greater than the query (q), if p > q, it moves up and checks the value at the 25% position. 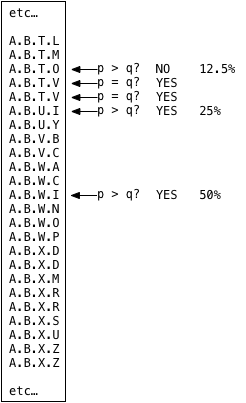 If the value is too small, if p < q, it moves down and checks the value at the 75% position. Repeatedly dividing the index into smaller and smaller pieces, Postgres only needs to search a few times before it finds the matching record or records. Now, my values are saved in a series of different memory segments arranged in a tree structure. Dividing the index up into pieces allows Postgres to manage memory properly while saving possibly millions of values in the index. Note that this isn’t the tree from my LTREE dataset; B-Trees are internal Postgres data structures I don’t have access to. To learn more about the computer science behind this, read my 2014 article Discovering the Computer Science Behind Postgres Indexes. Each value in the parent or root segment is really a pointer to a child segment. Postgres first searches the root segment using a binary search to find the right pointer and then jumps down to the child segment to find the actual matching records using another binary search. 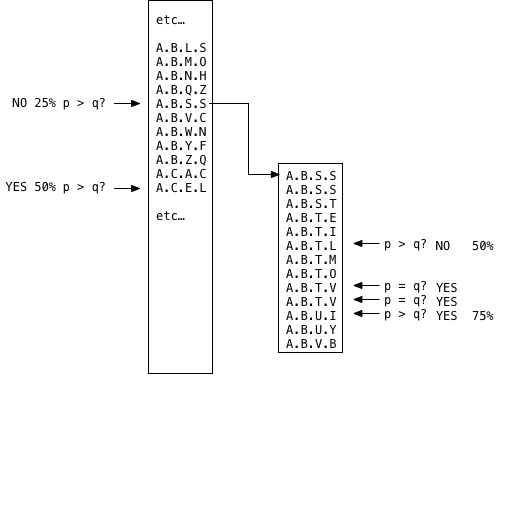 The algorithm is recursive; the B-Tree could contain many levels in which case the child segments would contain pointers to grandchild segments, etc. What’s the Problem With Standard Postgres Indexes? I was looking for records that were equal to my query: p == q. Using a B-Tree index, I could also have searched for records greater than or less than my query: p < q or p > q. But what if I want to use the custom LTREE <@ (ancestor) operator? What if I want to execute this select statement? As we saw in the previous posts in this series, this search will return all of the LTREE records that appear somewhere on the branch under A.B.V, that are descendants of the A.B.V tree node. A standard Postgres index doesn’t work here. To execute this search efficiently using an index, Postgres needs to execute this comparison as it walks the B-Tree: p <@ q. But the standard Postgres index search code doesn’t support p <@ q. Instead, if I execute this search Postgres resorts to a slow sequence scan again, even if I create an index on the ltree column. To search tree data efficiently, we need a Postgres index that will perform p <@ q comparisons equally well as p == q and p < q comparisons. We need a GiST index! Almost 20 years ago, an open-source project at UC Berkeley solved this precise problem. The Generalized Search Tree (GiST) project added an API to Postgres allowing C developers to extend the set of data types that can be used in a Postgres index. In the beginning, there was the B-tree. All database search trees since the B-tree have been variations on its theme. Recognizing this, we have developed a new kind of index called a Generalized Search Tree (GiST), which provides the functionality of all these trees in a single package. The GiST is an extensible data structure, which allows users to develop indices over any kind of data, supporting any lookup over that data. GiST indexes use a tree structure similar to the B-Tree we saw above. But Postgres doesn’t create the GiST index tree structure by itself; Postgres works with implementations of the GiST Union, Penalty and PickSplit API functions described above. And when you execute a SQL statement that searches for a value in a GiST index, Postgres uses the Consistent function to find the target values. The key here is the implementor of the GiST API can decide what type of data to index and how to arrange those data values in the GiST tree. Postgres doesn’t care what the data values are or how the tree looks. Postgres simply calls Consistent any time it needs to search for a value and lets the GiST API implementor find the value. An example would help understand this, and we have an example GiST API implementation: The LTREE extension! Starting in around 2001, two students at Moscow State University found the API from the GiST project and decided to use it to build indexing support for tree data. Oleg Bartunov and Teodor Sigaev, in effect, wrote a “Tree Paths Consistent” function, a “Tree Path Union” function, etc. The C code that implements this API is the LTREE extension. You can find these functions, ltree_consistent and ltree_union, among other functions, in a file called ltree_gist.c, located in the contrib/ltree directory in the Postgres source code. They also implemented the Penalty, PickSplit and various other functions related to the GiST algorithm. Notice the using gist keywords in the create index command. That’s all it takes; Postgres automatically finds, loads, and uses the ltree_union, ltree_picksplit, etc., functions whenever I insert a new value into the table. (It will also insert all existing records into the index immediately.) Of course, earlier, I installed the LTREE extension also. Because the values of p, the tree page keys, are simple path strings, ltree_consistent directly compares them with A.B.T and determines immediately whether each value is a descendant tree node of A.B.T. Right now, the GiST index hasn’t provided much value; Postgres has to iterate over all the values, just like a sequence scan. Now, suppose I start to add more and more records to my table. Postgres can fit up to 136 LTREE records into the root GiST memory segment, and index scans function the same way as a sequence scan by checking all the values. Now, Postgres “splits” the memory segment to make room for more values. 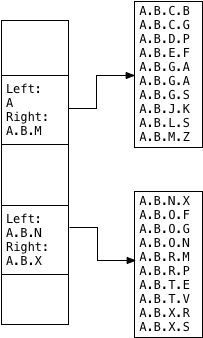 It creates two new child memory segments and pointers to them from the parent or root segment. The ltree_picksplit function — the LTREE implementation of the GiST API — sorts the tree paths alphabetically and copies each half into one of the two new child segments. Note that GiST indexes don’t normally sort their contents; however, GiST indexes created specifically by the LTREE extension do because of the way ltree_picksplit works. We’ll see why it sorts the data in a moment. 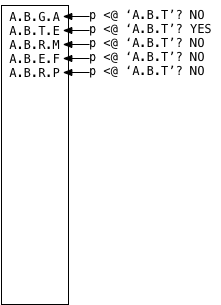 Note that A.B.M is sufficient here to form a union value excluding A.B.N.X and all the following values; LTREE doesn’t need to save A.B.M.Z. This is what a GiST index looks like — or, what an LTREE GiST index looks like, specifically. The power of the GiST API is that anyone can use it to create a Postgres index for any type of data. Postgres will always use the same pattern: The parent index page contains a set of union values, each of which somehow describes the contents of each child index page. For LTREE GiST indexes, Postgres saves left/right value pairs to describe the union of values that appear in each child index segment. 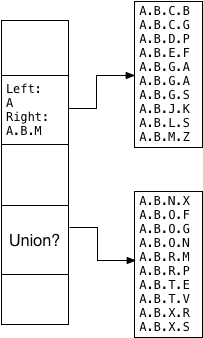 For other types of GiST indexes, the union values could be anything. 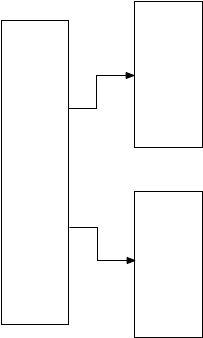 For example, a GiST index could store geographical information like latitude/longitude coordinates, or colors, or any sort of data at all. What’s important is that each union value describe the set of possible values that can appear under a certain branch of the index. And like B-Trees, this union value/child page pattern is recursive: A GiST index could hold millions of values in a tree with many pages saved in a large multi-level tree. Now, Postgres passes each union value to ltree_consistent to calculate the p <@ q formula. The code inside of ltree_consistent then returns MAYBE if q > left and q < right. Otherwise, it returns NO. 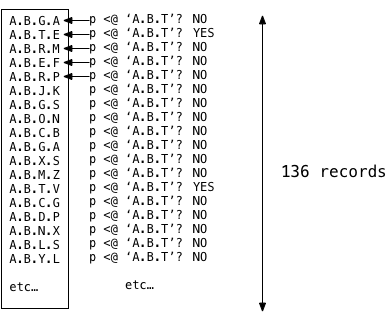 In this example, you can see ltree_consistent finds that the query A.B.T, or q, MAYBE is located inside the second child memory segment, but not the first one. 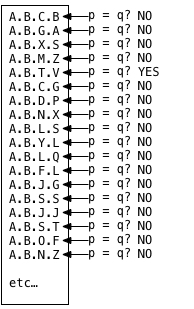 For the first child union structure, ltree_consistent finds q > A true but q < A.B.M false. 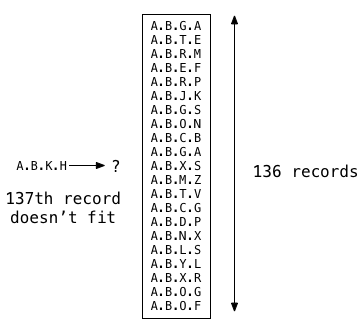 Therefore, ltree_consistent knows there can be no matches in the top child segment, so it skips down to the second union structure. 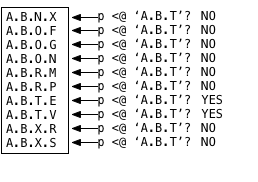 Note that Postgres never had to search the first child segment: The tree structure limits the comparisons necessary to only the values that might match p <@ A.B.T. Imagine my table contained a million rows. Searches using the GiST index will still be fast because the GiST tree limits the scope of the search. Instead of executing p <@ q on every one of the million rows, Postgres only needs to run p <@ q a handful of times, on a few union records and on the child segments of the tree that contain values that might match. Oleg Bartunov and Teodor Sigaev, the authors of the LTREE extension, explain its usage and the algorithms I detailed above here on their web page. They included more examples of SQL searches on tree data, including some which use the LTREE data type I didn’t have time to cover in these blog posts. Do you save tree data in Postgres? Does your app take advantage of the LTREE extension? If so, you should send Oleg and Teodor a postcard! I just did. Published at DZone with permission of Pat Shaughnessy , DZone MVB. See the original article here.